Is it possible to carry out or to facilitate dropshipping on Facebook? In our today’s example, we will look at the real-life case study of using Facebook for the purpose of a dropshipping business boost! In June 2018, there were around 1.47 billion daily active users on Facebook. Certainly, it makes this platform a curious and quite promising destination for eCommerce activists – imagine the size of an audience you can reach through this social network! We couldn’t ignore this impressive website, and decided to test its business opportunities by our own efforts. Here are the results! Can you practice dropshipping on Facebook? To begin with, it’s important to identify how exactly Facebook can help dropshipping business owners. You might think that it is a good idea to open a dedicated store within this social network: it attracts lots of users, right? Why not turn these numerous potential customers into actual buyers, and make them purchase your products right here, right now? Sadly, on a global scale, the process of buying and selling on Facebook is not as easy as it might seem. Theoretically, Facebook marketplace and Facebook buy and sell groups make it possible for users to demonstrate products and purchase the desired items. Still, these services are only available in around 50 countries across the globe. Plus, you can only shop within ‘your local community’, which means that buy-and-sell operations are heavily limited by geographic boundaries. So, if you want to launch a dropshipping store, it would be a wiser decision to choose a more convenient technical platform that allows showcasing goods, accepting payments and arranging effortless communication all over the words. It doesn’t mean, however, that you can’t use Facebook for dropshipping purposes. In terms of the business promotion, it’s a brilliant choice! The reason why we are so enthusiastic about Facebook promotion opportunities is that we know it for sure: this social network can really make a difference. This is the story of a successful SMM strategy for a dropshipping store that brought us $4,587 in just 3 months. To achieve these exciting numbers, we used a complex marketing strategy. If you sell online, there are different ways to find your audience. We used several promotion channels for dropshipping stores including PPC and on-page SEO, but the main focus was on working in social media – Facebook fan groups. Instagram, Twitter, Google+ and Pinterest were also involved, but on an additional basis. After we tried it all ourselves we are happy to share with you our tactics of how to deal with dropshipping on Facebook. Here’s a simple algorithm we’ve designed and tested! Step 1: Create a Facebook fanpage for your dropshipping online store and fill it with product posts and entertaining materials. Don’t forget to add calls-to-action, hashtags and enticing captions. Visual content is always the winner! Step 2: Find and join dozens of niche fan groups with as great a number of subscribers as possible. Step 3: Share your entertaining fanpage content in these groups to get likes, shares and subscribers to your fanpage. Step 4: Watch all these activities turn into rich social traffic to your ecommerce store. You should see high conversions, great revenues and happy clients! Anyone can do it without any special skills and expertise, don’t you agree? To try out the algorithm we’ve created, we used one of our self-owned dropshipping stores. Disclaimer: This particular store was mostly used as an experimental playground to test, evaluate, and improve various selling techniques and online management tools. As of now, this store is inactive – we have stopped using it for ethical and legal reasons, and we strongly advise all our readers and clients to avoid selling branded/copyrighted items. Still, feel free to follow the promotional algorithm we’re describing in this case study! We created the dropship store’s fanpage on Facebook and filled it with primary content before starting the promotion. We published a mix of product (commercial) and entertaining (neutral) posts. The second category included actors’ shots, citations, movie related humor, etc. 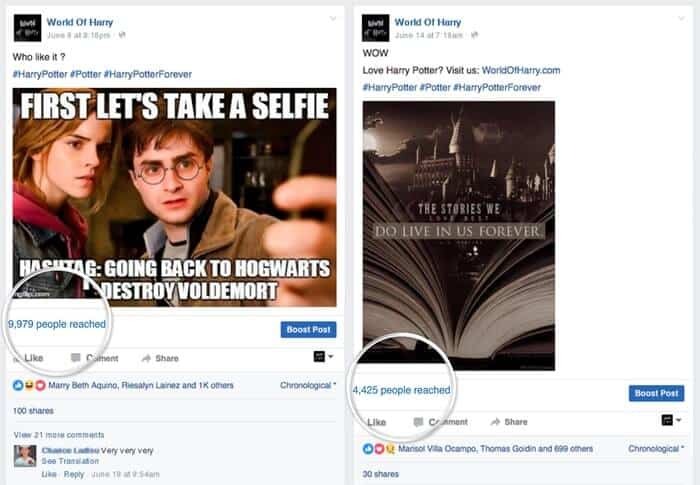 Photo captions contained calls-to-action, links to Worldofharry and popular relevant hashtags to grow the reach. Example: “Like if you remember! Love Harry Potter? Visit us: WorldOfHarry.com. #‎HarryPotter #‎Potter #‎HarryPotterForever”. Product posts contained a merchandise image, several calls-to-action (“like”, “share”, “tag a friend”), a product name, a note about free worldwide shipment and a link to the product page. Example: “Like and Share if you want this Severus Snape Magical Wand! Tag a friend who would love this! FREE Shipping Worldwide. Get it here /link/”. We found numerous closed and open Harry Potter related groups – the biggest ones with most active subscribers (our target audience). Social networks are a densely populated meeting place for any movie fans, with Potterheads being no exception, and so it was not a problem at all. We joined these groups, although sometimes it took time for us to be approved as members. 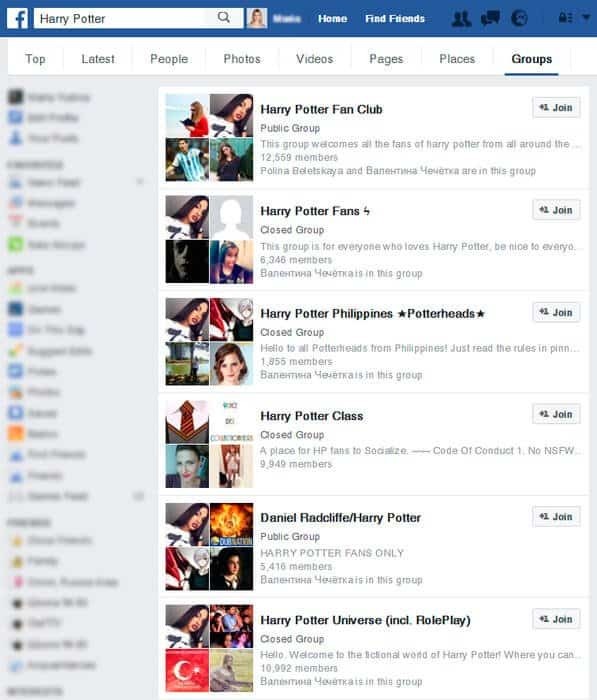 Having become approved group members, we shared posts from the World of Harry fanpage in these groups. It is simple – you can easily do it yourself! A. 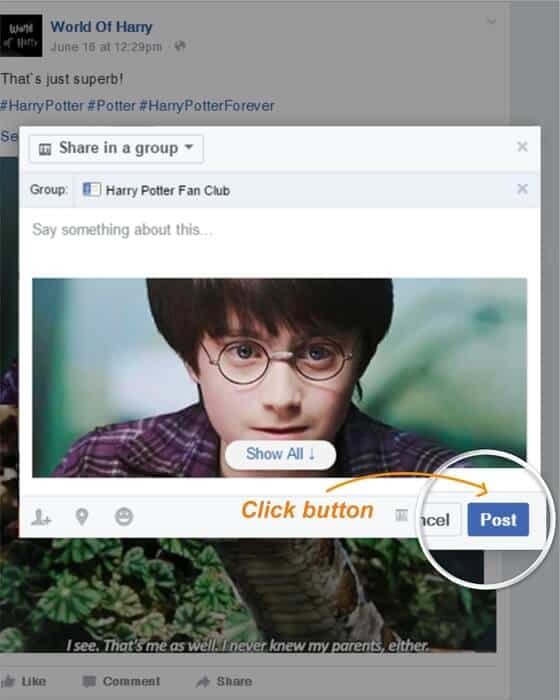 Select a post to be shared in a FB group. 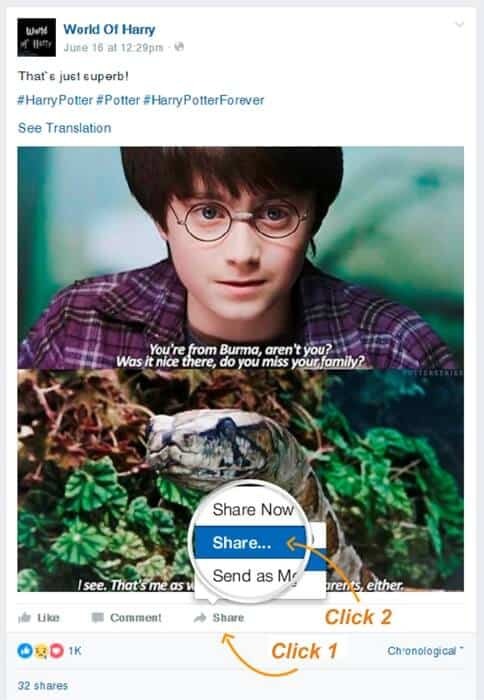 Click the “Share” button and select the second option – “Share…” (the first one will make a repost in your personal timeline, not a group). B. 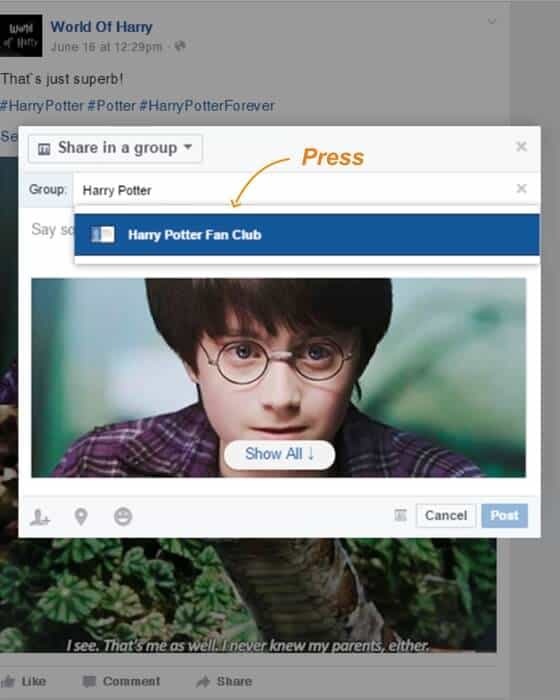 Select the “Share in a group” option. C. Start typing the group’s name in the “Group” field until you see the needed group name offered by Facebook below the field. D. Click the offered group name – it will appear in the “Group” field. Click the “Post” button. Done! Your repost is already published in the group or is waiting to be approved and published (depending on the group’s moderation policy). Our reposts were published right away or quite soon after pre-moderation. Since all the posts were visual, entertaining and non-advertising (commercial product posts were not shared in groups), about 99% of them were approved by the groups’ admins and appeared in the subscribers’ feed. Sometimes (in the biggest and most popular communities) we had to pay a little fee, which was about $25 for the post to display in the group for 3 days. These expenses always paid off many times! 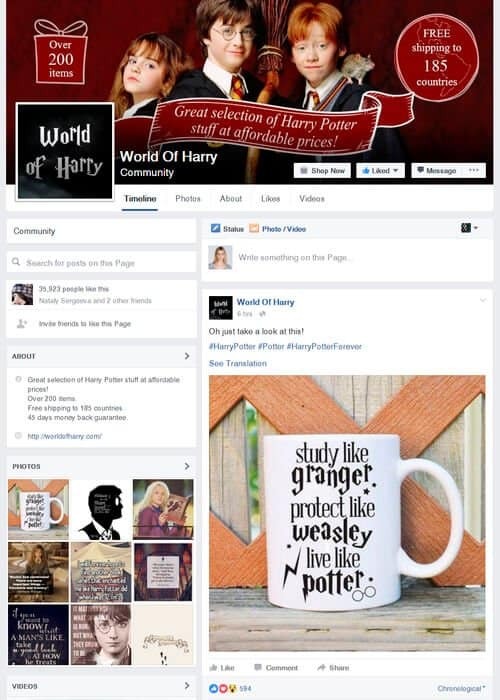 Since the post captions contained backlinks to Worldofharry, the dropshipping webstore’s traffic stably made up 7,000-9,000 sessions per month. In the first three months of SMM activities in Facebook groups, the dropshipping webstore got 353 orders from social traffic. Fulfilled orders brought us $4,587. 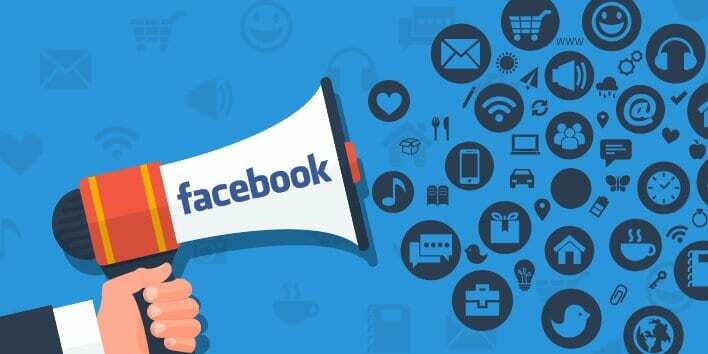 Promotion of your business activity in the field of dropshipping on Facebook is very simple and extremely effective for any fan online store. Taking into account that FB boasts billions of users, every merchandise store can find its audience here. And every dropshipping store owner can easily follow the steps we’ve described – and repeat our success. Everyone who wanted to start their own drop shipping businesses and now are reading this are on the right way! Using this business model, you don’t need great money to start selling products. Shipping costs – if any– are included in your price. 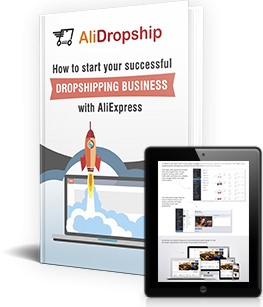 With AliExpress it’s very easy to find reliable dropshipping suppliers for your ecommerce business. All you need to launch a profitable dropshipping store is to stop hesitating! 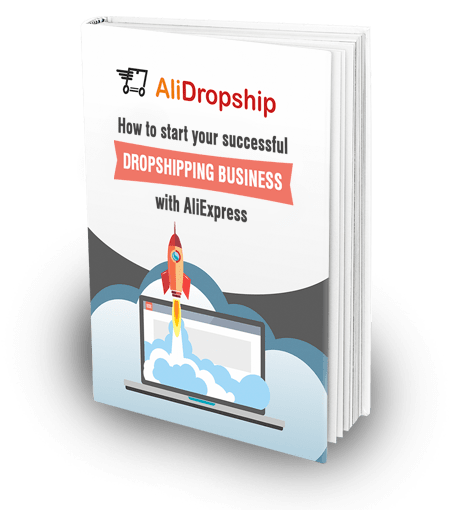 Don’t lose your time, start a dropshipping business with AliExpress – the greatest ecommerce platform! Polina Beletskaya, the Head of Marketing Department at AliDropship, has spent over 7 years as a strategy consultant, working with brands across the world to deliver results from their online presence. Does the script have payment processor pre-installed? Which payment processor are being used? How many themes does the script has? How do you deal with returns? Is the script automatically order the product on Aliexpress? Sorry for all these questions, am interested. 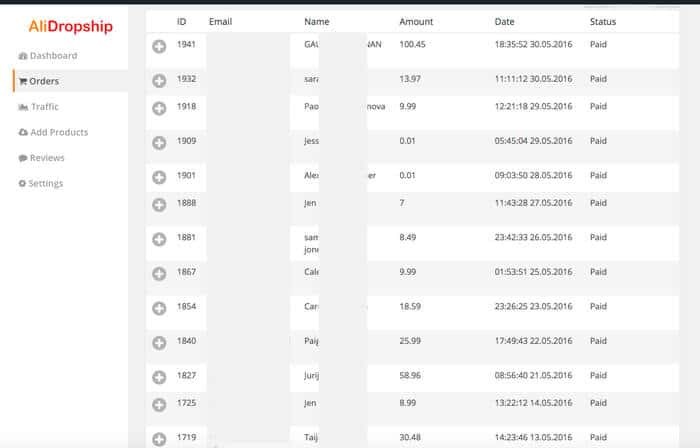 The AliDropship plugin has integrated payment systems like PayPal, Stripe, PayU, 2Checkout, Authorize.net. Currently the plugin comes with 2 themes and the number of templates will be increasing. Regarding returns, AliExpress has a good protection system with full money back guarantee. So, if your customer is not satisfied with a product and asking for refund you should dispute the purchase with AliExpress seller. If you are selling not expensive products your AliExpress suppliers usually refund you quickly without having to return the items because they don’t want the headache of disputes and receiving returns for relatively low value items. This enables you to give a full or partial refund to your customer through PayPal without them having returns either. The reputation of the wholesaler is rather exposed and they are willing to do anything to maintain their feedback rating. We are going to add auto-order feature next week. Did you added auto-order feature? Let’s say I want to integrate a system with no refunds and returns. Can I do that? Do you have to pay specific taxes to the country you are from if you open an alidropship store? For example i live in romania , i pay my hosting , but do i have to pay aditional taxes to my country? Hello Yaros! I got the plugin a couple of months back, and I didn’t see any of the themes you just mentioned in the package. I hope I didn’t miss something? Can I integrate paystacks with alidropship as I am from Nigeria. no, we do not support this service. I wonder how you get this done, I prefer not to mix my private facebook profile with business. Hello! If you don’t want to use your own account for sharing, I recommend that you create a new one, but you need to invite more friends. You may join the following groups on Facebook https://www.facebook.com/search/groups/?q=add%20in%20friends and add friends gradually (10-15 per day) or you buy ready-to-use FB accounts for sharing. How many member of group to doing promotion yaros? How to find best facebook group related with my niche? Any tools or what? You should use Facebook internal search for the groups in you niche (please see screenshot for Step 2 described in this article). Enter keywords related to your niche into the search field and look through the results. Number of members is indicated for every group: the more members – the better! Just choose the biggest groups for each keyword, join them and begin working. Do I have to create a nee facebook account in order to share to groups with page name or can I just use a personal account and switch the user from there? Yes, you can create a page from your current personal account (and get the role of its administrator). Switch to this page when sharing so that all reposts were on behalf of the page, not you. I just selected a very pasionate niche and joined 40+ groups ranging from 2k to 200k but some of them are not in english, do you think I should focus more on posting to english groups? And what are the recommended amount of posts per day to groups to keep low profile? As for the posts frequency, we try not to share too often in one and the same group – one post per day for a big dynamic group with lots of daily updates seems enough. Nothing 1 minutes, my account is banned in the group facebook. Why its happens? You send example with share my post fanpage. Can you explanation to me more? It can happen and it depends on the group admin. do we need to add another eComm plugin like wooCommerce or Alidropship contain all needs ? AliDropship plugin is a completed solution, you don’t need to install other platforms. I am interested in getting this plugin. would you please email me, if I need to have a Ali Express affiliate I.D. ? I am not an affiliate for Ali Express. 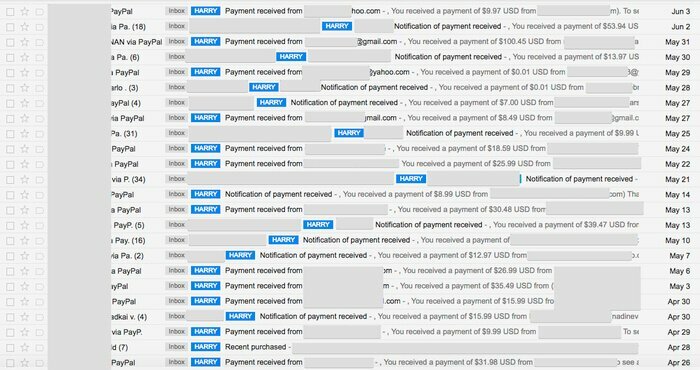 To earn affiliate commission as a bonus to your main dropshipping income source, you don’t need to apply for AliExpress affiliate ID. You will only need to register with AliExpress Admitad or EPN programs. How do you join group as a page?only profile can..or did you share your page post using your profile. Yes, you need an account to join groups, but you share using your page. 1. Choose any group and join it using your profile. 2. Then open your Facebook fan page and choose one of your posts. 3. 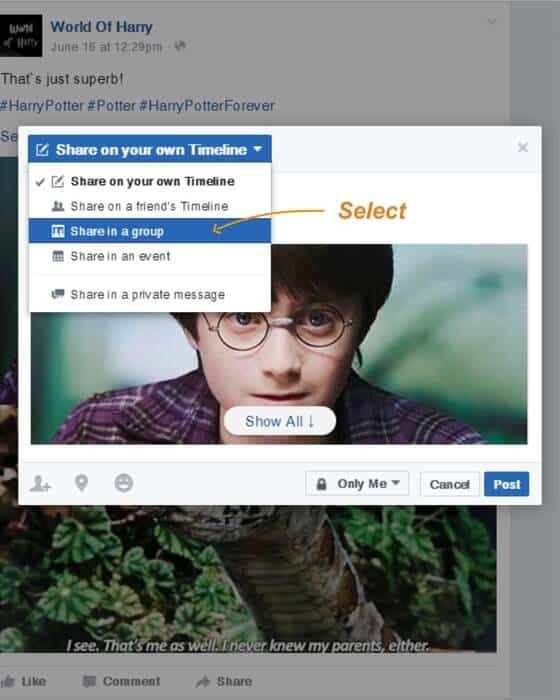 Click “Share”- “Share” – “Share in a group” and “Posting as”- choose your Page name. What did you use the make the welcoming video on the home page ?? This video is created with the help of Adobe AfterEffects tool. Hello Yaros, Just joined the Alidropship program for a custom website design. the best company to join. Again thank you for your guidance. Hi, I created new FB account joined some groups.. but when I go to share > I cant see options share on groups…. I think that option to share with groups has changed. May I know which option is better? 1. Create a new FB Account and adding some friends before sharing our FB business pages to the niche groups? 2. Joining niche groups by our private FB profile and share on these niche groups (posting by our FB business pages) ? Can share in detail how you do it? I would recommend using both ways. I found that some of the group no need permission to post or share your posts. Would it be good to share our commercial post in these group? Is there any limits on the number of shares per day by a private FB profile? I have joined about 40+ groups worldwide that relate to my theme. I have written blogs on my website and then shared them on the groups without any problems from the group admins. If I try to put products on these blogs I’m sure they will never get past the admins. My problem is that I can move large amounts of traffic to the site when they click on the group posts but very few of them ever even see the products I have listed because they can’t see them on the blog post. It would be helpful if I could post products through a widget on these blogs. Any suggestions? I recommend setting the blog up on a navigation bar next to ‘store’. That way everyone immediately knows theres a buying option 1 click away. Hi Yaros, I have a question after we joined the group, then we will start posting content from our website, did we post it as our personal profile or as business fans page? I am just surprised that posting as fans page was allowed in some groups. Hi, we can post with a business page. Can you check this still works as some people saying FB no longer allows this.? Of course it works. Probably, some users are confused because they are trying to post on FB pages, not FB groups. I tried to share one of my post in my business page to the one of the FB groups that I have joined but it was posted using my personal account. There is no option to post as my page but this can be done on my own page. Please advise if the above strategy is still possible? I think the secret is to start a new “incognito” FB account without using your real name. Admin probably can’t say this but I think it’s what is being done. You could change your profile name ( I have successfully done this) but you may be liable in the future if you get found out of course. There’s something called VPN’s (virtual private network) that allows you to hide your IP address so FB won’t know where your from, so you simply start a new FB profile with a name that they can’t detect is a business one, something generic. Hide.me is a VPN provider. Then you’ll have to rejoin your FB groups but as your new profile name so they won’t know it’s you. Wondering, how is the frequency of sharing our FB Page to FB groups? Is this strategy still working fine? @yaros. Highly appreciate if you could advise on it. I don’t understand why admin won’t answer these questions. I also have very important unanswered questions on the forums. Anyway, the secret is to not spam too obviously to the groups and not too often. Some say no more than 6 groups a day. What do you mean by the captions contained links to the website, how do you do that? I tried many times share from my page, but still posted from private account not directly from the page. Can advise? Thank you. Is it working in Tanzania?